Stainless Steel Dragon Pot with Deep Dish Steam Basket! 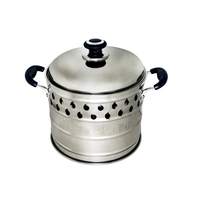 Dragon Pot with custom Stainless Steel Steam Basket Insert (extra accessory, best value combined!). This is the most efficient boiling / cook pot you will ever use! The SilverFire Stainless Steel Skirted Dragon Pot is amazing for both wood fired stoves or your residential gas cooktop (including natural gas, propane, or butane). This is the most efficient cooking combination pot and custom steamer basket you have ever used! It is designed for any open flame and reduces approximately 1/2 your fuel cost when cooking with natural gas, propane or butane! Boiling times are reduce significantly (30 - 40% on average). Our 6.5 liter (1.7 gallon) Dragon Pot is a must have rocket stove option (it also first our Hunter, Super Dragon gasifier stove models, or as an amazing cooking option to increase efficiency on gas cook tops. It will provide just under 2 gallons of emergency drinking water , quickly boil large volumes of pasta or noodle water, prepare steamed foods, or provide an adequate volume of heated water to sanitize your cookware. Just say "No" to inefficient Pot Skirts. A skirted pot is a much more efficient option than a pot skirt, increasing heat transfer, reducing time to boil, emissions and fuel use. How it works: This specialized pot has a full skirt that protrudes below the bottom of the stove top or trivet and forces flames to lick the walls of the pot in addition to the bottom. This skirted pot is capable of bringing large volumes of water , soups, sauces, or stews to a boil incredibly fast by capturing additional heat, compared to a traditional pots which heat transfer is lost after hitting the bottom of the pot and deflected into the atmosphere. The Dragon pot captures and retains this heat, forcing the flames to lick the vertical walls of the pot, increasing heat transfer. The heat transfer is superior to pot skirts or traditional pots. This amazing pot is experiencing high levels of repeat sales. Customers are often ordering a second Dragon pot for dedicated use with their residential gas ranges to save both time, energy and expense while cooking, in addition for use with there biofuel / biomass stove. Customers are excited by its ability to reduce energy costs, fuel use, heat in the kitchen in warm weather, and time to boil. Many exclaim this is the most amazing piece of cookware in there indoor or out for kitchen! This Dragon Pot is significantly faster than a Kelly Kettle or other Water Kettles that only heat from the inside out, since our Dragon pot provides the open flame greater surface area. Our Dragon Pot is providing up twice the volume of Kelly Kettles or other Water Kettles Too! Bottom line, in an emergency your greatest need to to provide lots of hot water. Safely do more, and do it faster with our Dragon Pot! It is the only double clad, stainless steel, & full skirted pot on the planet. 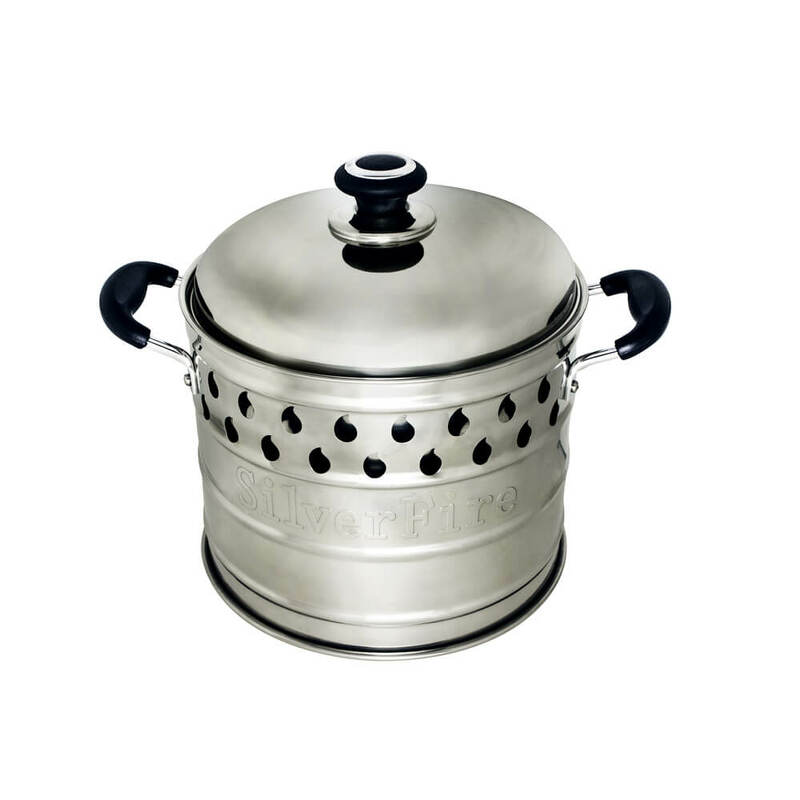 Our stainless steel, double wall pot reduces cook time by 5 minutes or more, bringing 5 liters of water to a boil. This represents a 30% or greater time reduction bringing pot to a boil. 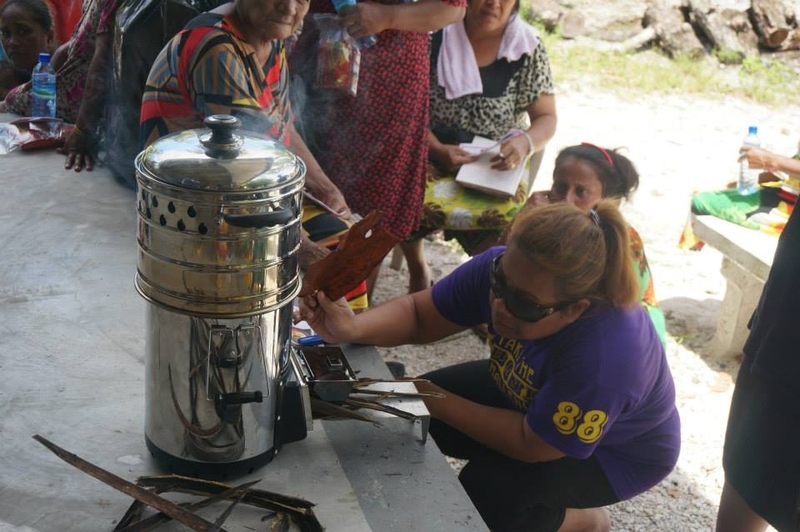 It also helps to reduce emissions, fuel use, and time spent cleaning sooty pot exteriors.This pot design is significantly safer and more efficient than cumbersome, dirty, poor quality low profile pot skirts sold with other low quality mild steel rocket stove brands or cumbersome tall water kettles with safety issues balancing cookware on slender bases! A full skirted pot is much more efficient than a pot skirt. Our fixed Dragon skirt protrudes below our Survivor cast iron cook top, so the pot is firmly seated in place and cannot fly off stove burning children or cook when stirred! This provides a huge safety factor too, reducing both burns to toddler or cook. The stainless steel pot bottom is constructed with two layers of quality stainless steel for extended shelf life, unlike other lower quality thin single bottom layer skirted pots. This pot is twice the build and fit & finish of the last skirted pot design we implemented for inferior brands. Best of all there is no dirty or sooty pot skirt to loose or waste time cleaning. Cooks also love fact the Dragon Pot skirt exterior is soot free, since soot forms under the skirt or on bottom of pot, reducing exterior pot cleaning chores when cooking with biomass. Our skirted pot is much faster boiling water for emergencies or cooking, than slow heating pasteurizers and numerous other water kettles we have tested. It is significantly superior to pot skirts and why we do not provide pot skirts with the SilverFire stoves. This Dragon pot can also be used on the Hunter and Super Dragon stove models. Just say no to inefficient pot skirt designs and improve emissions, fuel use and safety with the fully skirted Dragon pot! Any cook is going to appreciate the reduced time to cook having no pot skirt to scrub or keep track of! The Dragon Pot is shipped fully assembled! Robust heat resistant pot handles are shipped attached with 4 simple Phillips head screws, along with the lid and skirted Dragon pot. The pot is fully assembled. Special Note: The handles are tightened by aligning Phillips head screws into fixed pot skirt imbedded pem nuts, by hand with specialized long handle 8mm or 5/16" wrench. In the event pot handles become loose due to cooking or heat expansion over time, take a #2 Phillips head screw or broad flat head screwdriver is used to tighten screws, do not use too much force or this may result in breaking pem nuts loose from anchor points behind skirt. In the event you make this mistake, turn pot upside down and hold pem nuts in place with a long thin 5/16" or a 8 mm open box wrench and re-insert Phillips head screws to tighten. Long hemostats can also be used to fit in gap between pot and skirt to secure nut to receive Phillips head screw to attach handles. Do not be a Gorilla and over tighten the Phillips screw heads! Please note many of our important stove and cookware options are found on our Cookware, Accessories, and other product links!